This CellML version of the model has been checked in COR and OpenCell and the model runs to 'almost' recreate the published results. The only difference is the CellML model is missing the time delays. Although it is possible to express time delays in the CellML language, the software tools PCEnv and COR are currently unable to handle time delays. The units have been checked and are consistent. The author of the original model was involved in the process of translating the model into CellML and his help has been invaluable. Abstract: Genistein is an endocrine-active compound (EAC) found in soy products. It has been linked to beneficial effects such as mammary tumor growth suppression and adverse endocrine-related effects such as reduced birth weight in rats and humans. In its conjugated form, genistein is excreted in the bile, which is a significant factor in its pharmacokinetics. Experimental data suggest that genistein induces a concentration-dependent suppression of biliary excretion. In this article, we describe a physiologically based pharmacokinetic (PBPK) model that focuses on biliary excretion with the goal of accurately simulating the observed suppression. The mathematical model is a system of nonlinear differential equations with state-dependent delay to describe biliary excretion. The model was analyzed to examine local existence and uniqueness of a solution to the equations. Furthermore, unknown parameters were estimated, and the mathematical model was compared against published experimental data. Schematic diagram of the genistein PBPK model. The upper components represent compartments containing the pure genistein (gen) while the lower components contain genistein that has undergone conjugation in the liver (con). B - plasma, rp - richly perfused tissues, pp - poorly perfused tissues, l - liver, GI - gastrointestinal tract, ROB - rest of body, Ab - bile-delayed compartment. 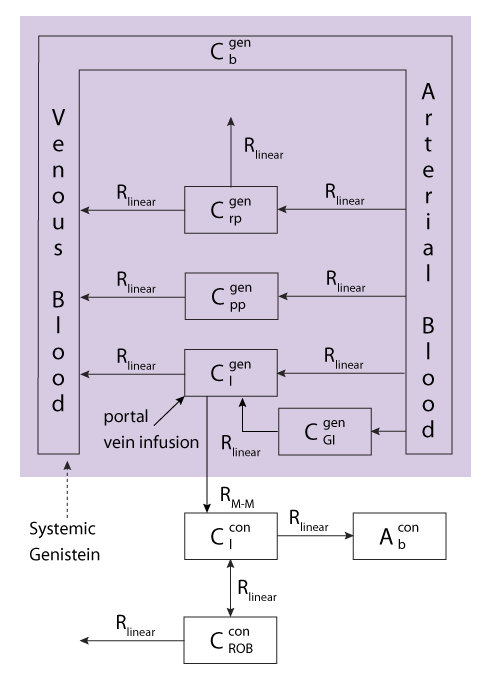 The arrows represent genistein transfer as blood flows between the organs and the systemic circulation, and also genistein elimination in the urine (out of Ccon_ROB); these are all linear with the exception of the conversion of pure to conjugated genistein in the liver which follows Michaelis-Menton kinetics. Derived from workspace Zager, Schlosser, Tran, 2007 at changeset 98706eef6bcb.